If a picture is worth a thousand words, then video running at 30 pictures per second is priceless. Right? Well, not necessarily. The so called "Ken Burns" effect, popularized by the documentary film maker of the same name, has breathed new life in the art of using still images to tell a story. His innovative "pan and scan" technique involves initial zooming into a still image and subsequent panning to create further interest. Zooming back from a tight view of the picture allows the viewer to take in the full impact of what is portrayed. Burns used historical photos for his documentaries, but the same effects can be achieved with photographs produced by today's high quality digital still cameras, or with scanned documents. Digital cameras have eased the acquisition of source images, and pan and scan software has simplified achieving the effect for use video editing applications. Software to produce the "pan and scan" effect is available for the Mac at many price points and sophistication levels. iMovie's built in generator produces the effect, as well as Toast Titanium's bundled Motion Pictures. 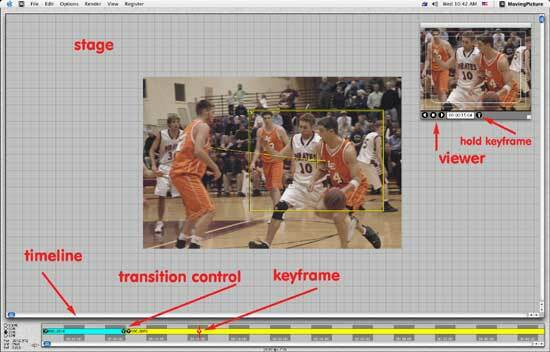 You can key frame photographs in Final Cut Pro and After Effects, or purchase plug ins to ease the process. Shareware packages such as Still Life 2.1.4 (http://www.grantedsw.com/) and PhotoToMovie (http://lqgraphics.com/ can be downloaded from the Internet. One cross platform product, however, operates as plug in for most video editing packages or as a standalone app. Moving Pictures Producer, from StageTools (http://www.stagetools.com/) is a pricier OS 9 and OS X "pan and scan" application with a number of features. While I highly recommend this application because of its excellent output, the interface needs some housecleaning. It still remains the standard by which all other tools on the Mac are measured. I evaluated MovingPicture Producer (MPP) which functions as a standalone program that works independently of an editing program. I prefer this method outputting video files because I can elect a lossless codec for eventual encoding to DVD, my usual output format. MPP will also output to various QuickTime and Avi formats, and produce Flash output on the Windows version. I tested the recently released OS X (Panther) version of MPP. When you purchase MPP, a utility determines an identification number for your computer and your registration number is linked to the ID. Obviously, this secures the single user license you purchase, but it also could cause workflow issues for the professional if your computer requires repair or is otherwise unavailable. I'm not a huge fan of this restrictive approach to licensing because it has the potential to interfere with the production process and seems to penalize the innocent. The Interface. Upon launch, the MPP main window is presented which includes a stage to position views of the photograph, and a timeline to orchestrate their sequence. The application menus are simple. Located in the file menu are commands to load pictures and to set resolution to NTSC, PAL, and Film. A "make movie" command includes inputs for size, frame rate, fields, and other parameters. You can also batch render projects. The remaining menus are self explanatory, and include controls for changing the aspect ratio to 16:9 and letterbox. Of interest is support for multiprocessors on both platforms, which is a boon for rendering for larger image project, which MPP supports up to 8,000 x 8,000 pixels. It also provides a motion blur setting, which smooths fast motion pans and zooms, but significantly slows rendering time. I also noticed a ghosting of the last few frames of a completed dissolve transition when rendering with motion blur was enabled. Turning off motion blur eliminate the ghosting. The ease controls settings are emblematic of simplicity of MPP. As you can see, ease controls are either on or off. Although the stock parameters for ease in/out perform well, I'd love to see more control over these functions because they are important to enhance the visual. There is a Per-KeyFrame feature, which is used to control how the move flows from the selected to the next key frame. It is invoked by control clicking on the key frame. A slider controls the speed and input boxes can be used to numerically enter the effect you want. And interesting feature of MMP is the "prep picture" command. It enables minor image editing for an imported picture. 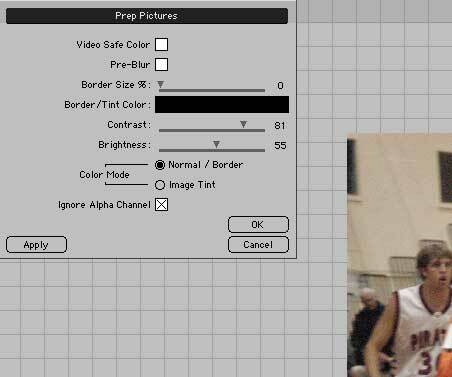 There are standard contrast/brightness commands and checkboxes for video safe color, pre blur, and "ignore alpha channel." The changes cannot previewed, however. To see the effect, they must be "applied," which limits the usefulness at least for the image editing controls. In MPP, as well, multiple images share the changes you made, rather than the only individual image you've selected. I'd suggest prepping your images in Photoshop instead. Workflow. MPP follows the traditional workflow of most pan and scan software programs. Load a picture into a timeline and set the initial view of the photo using a resizable and moveable yellow outline box called the "camera." Move the CTI to a second position in your timeline, and move and/or resize the camera to a second view. You can add a hold key frame at a subsequent time, make sequential moves with the same picture, or load additional photos. Up to 64 photos can be added to MPP. A useful, but undocumented feature automatically rotates photos to the proper orientation upon import ­ a timesaver. Transitions. I initially believed that MPP did not support transitions between photos. However, I discovered you can add a simple dissolve transition by moving a very small triangle at the cut point between two pictures, and dragging it to the right. This is one of the interface complaints I have with MPP. The triangle is difficult to grab. Setting a transition of a specific length if cumbersome, because there is no specific visual feedback about its length. I encourage StageTools to provide a preference setting to add specific length transitions, or develop a more accessible and interactive tool for creating transitions. The Viewer. The viewer is used to preview image scans from beginning to end or from any point in the timeline. It contains simple start/stop and reverse play controls, and a tool to add hold key frames. While it does basic motion previews, it does not preview transitions. The viewer will display title and action safe guides and the viewer can be resized and repositioned in the interface. The screen/title safe guides are available in the options menu, which contains additional menu commands to enlarge or contract the timeline and zoom in/out of the stage. At the lower left of the interface are check boxes used to resize the stage. Coordinates also show camera views by position, width and rotation at any point in the timeline. Menu Commands. This type of software doesn't require a lot of menu commands, but it lacks keyboard commands to invoke what is provided. Too often I found myself having to use the mouse because no keyboard command equivalent was available. This slows workflow unnecessarily. I encourage StageTools to provide these options in a future release. Rendering and Output. The draft quality option is four to six times faster than a full quality render and is used to test moves for smoothness and effect. Also, you can opt for multiprocessor support to speed rendering. However, if you select this option with a single processor computer, rendering will actually slow. As indicated earlier, the motion blur option smoothes output when the motion is fast but with a performance hit. 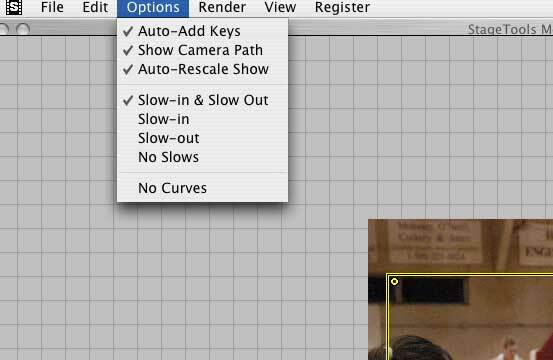 Stay with straight cuts, if you are using motion blur. Additional advanced options control field order, and enable you to set a default folder for locating images when rendering from different computers. You can add a soundtrack and render Flash files but only in the Windows version of Producer. Additional information, online manuals, FAQs, information about compatibility with various editing programs and other information is available at the company's website along with an on line support forum. Impressions. MovingPicture Producer is characteristic of few motion graphics applications that produce excellent output with a minimum of controls and distraction. I have either used or evaluated most of the competition, and view MPP as producing the best overall and consistent quality of pan and scan video files. Its support for 8,000 x 8,000 pixel output is unique, although its 64 picture limitation is a minus. That said, my others gripes with Producer are interface based. All things considered, however, this is one tool you should consider.